This updated and extended book (August 2018) will transform your ability to deal with stress and enjoy a healthy balance at work. - Did you really set out in business to feel this tired and stressed ? - Finding it difficult to get life and work into any sort of balance ? - Relationships with family and friends suffering ? - Constantly battling with low levels of energy and libido ? - Unhappy with your body image and what that says to others ? - Struggling with health issues and concerned about the consequences ? This is the moment to take effective and positive action ! 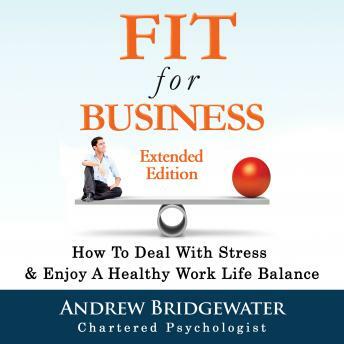 “Fit for Business: How to deal with stress & enjoy a healthy work life balance” is the definitive guide to creating a lifestyle which will enable you be truly effective in business whilst also having all the time and energy you need to fully enjoy life outside of work. Andrew Bridgewater qualified as a Chartered Psychologist at the age of 44 after spending 20 years in management roles for blue chip companies and consultancies. Andrew now works as a professional trainer, coach and author, helping business executives transform their health, energy and stress levels and live life to the full.